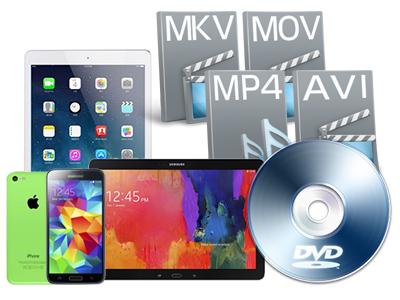 Convert DVD to numbers of players like iPhone 5S, iPad Air, PSP, PS4, etc. 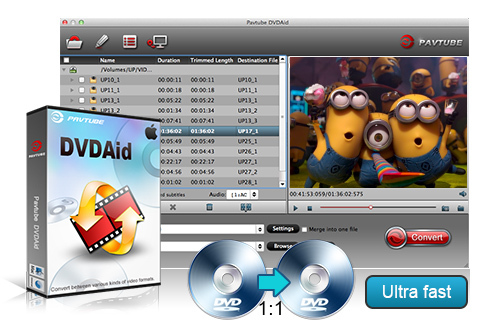 As the best DVD ripping software, Pavtube DVDAid for Mac offers Mac users the efficient way to copy disc with 1:1 DVD structure and save to computer hard drive without quality loss. At the meantime, it helps convert any DVD movies to almost all popular SD and HD video formats like H.264, DivX, MP4, AVI, WMV, MOV, FLV, MKV, etc. and you could freely watch DVD movies on iPad, iPhone, Galaxy Tab, Galaxy Note, Nexus, PSP, PS3, and other multimedia devices. Once you get this app, DVD movie experience can be extended not only on Mac but also on the move. 1.When ripping/converting DVD using Final Cut Pro oriented format templates(e.g. Apple Prores), please ensure that your computer has Final Cut Pro installed, otherwise the converted files will have audio only without image. Convert DVD to playable file type for iPad, iPhone, Smasung Galaxy Tab, Nokia, Google Nexus, HTC, Android smartphones, tablets, etc. Backup a complete 100% DVD VOB movie without extracts. 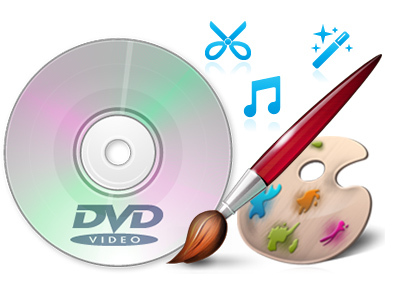 With a built-in video editor, you are able to create DVD movies as per your needs and share with friends or enjoy by yourself. 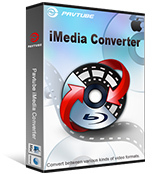 Pavtube DVDAid for Mac offers you a practical way to rotate videos, apply special visual effects, change the video parameters, trim, cropping, add subtitles, watermarks and more. built in a practical and easy-to-use video editor, which allows you to customize source DVD movies for personalized output files. It could trim video length, crop video size to remove black margins, adjust video effect, apply image or text watermark, etc. 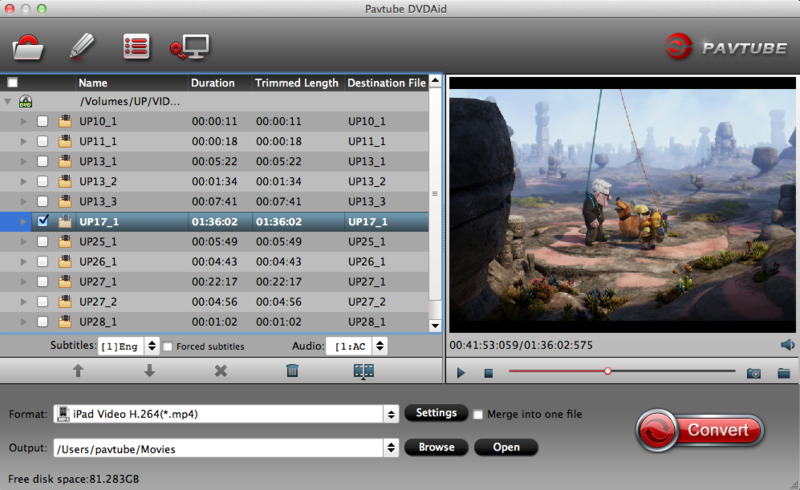 To get best movie playback, Pavtube DVDAid for Mac allows you to adjust video and audio parameters including: video codec, audio codec, video size, bit rate, aspect ratio, frame rate, channel, etc. so that the output DVD movie could meet your target players or purposes more. Pick up the preferred audio track and subtitles for saving in output DVD movie to get better enjoyment. 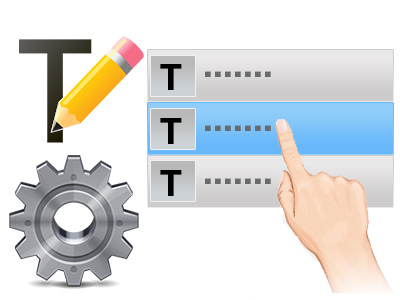 One-click to rename and distinguish the output file; easily customize output destination to your computer hard drive or directly to NAS server. Work well on Mac-based computer, including the latest Mac OS X 10.9. A built-in DVD player for video previewing and screenshot snapping to save your favorite scene. 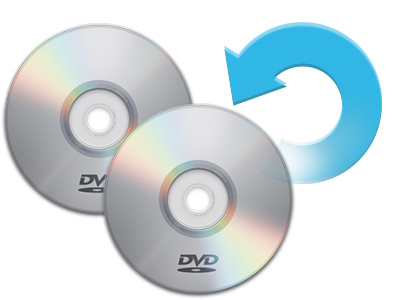 Combine multiple DVD chapters or titles into one single file for playback without interruption and continuous enjoyment. 1.Support encoding to HEVC MKV. 4. Corrected the default locations to the right directories instead of Document. * Choosing main title for DVD by default/ full disc copying without choosing root title manually. VLC 2.0 Won’t Ripping Commercial DVD Movies on Mac, Fixed! Unable to Rip Protected DVD with Handbrake on El Capitan? Solved! Best Mac Multi-track Blu-ray and DVD converter to improve movie experience. Pavtube BDMagic for Mac is a user-friendly and handy tool for Mac OS users to backup, convert and edit Blu-ray/DVD discs with simple operations.